Out of the little town of Bethlehem the prophet proclaimed would come forth He “that is to be ruler in Israel.” God promised David, “thine house and thy kingdom shall be established for ever before thee: thy throne shall be established for ever” (2 Samuel 7:16). That promise was repeated for David’s son, Solomon, with the condition that he continue in that pattern modeled by his father (2 Chronicles 7:17-19), but beginning with Solomon, that condition was unmet until at last Jeconiah (a.k.a. Jehoiachin and Coniah) caused the Lord to curse Solomon’s line saying “Write ye this man childless, a man that shall not prosper in his days: for no man of his seed shall prosper, sitting upon the throne of David, and ruling any more in Judah” (Jeremiah 22:30). Joseph, Jesus’ adoptive father, was from this cursed line (Matthew 1:11). But in this, God did not fail in His promise to David, for Mary too was of “the house and lineage of David” through another branch that did not include any of Solomon’s descendants (Luke 3:23-31). Her line was free of the curse, establishing Jesus’ right to the throne both legally and by inheritance. So it was that in the “House of Bread” the Bread of Life (John 6:48) came into the world – He “whose goings forth have been from of old, from everlasting,” i.e. He is eternal. He said, “I am the bread of life: he that cometh to me shall never hunger; and he that believeth on me shall never thirst” (John 6:35). He also compared Himself to the vine and His followers as the branches. “I am the vine, ye are the branches: He that abideth in me, and I in him, the same bringeth forth much fruit: for without me ye can do nothing” (John 15:5). Bethlehem Ephratah – the Fruitful House of Bread – birthplace of the Fruitful Bread of Life. The baby in the feeding trough, surrounded by smelly farm animals and adored by a small crowd including a soft-faced young mother, strong bewildered father, common shepherds and majestic kings makes for a sweet, albeit often overlooked, tableau. If noticed at all, its significance evaporates in clouds of sentimentality. How precious! Do you not see! The Creator of heaven and earth reduced to a helpless, needy, human infant boy. The Owner and Master of all Creation presented to the world through the birth canal of a young virgin girl. The conception itself made an object of ridicule and shame; conceived outside the “knowledge” of a poor carpenter willing to accept the ridicule of the town’s people, and adopt someone else’s child. The engineer and designer of a finely tuned universe born in a dirty cave allotted to animals rather than a fine palace suitable for the King of the Universe. Rather than a reception by kings, dignitaries, and nobles, the first to greet Him were the low-class, detestable shepherds that kept the sheep for the Temple sacrifices. This was “God With Us,” Emmanuel. God wrapped up in human flesh. Who could conceive of such a thing! The Jews expected a Messiah to turn Israel into a superpower; but Messiah was a man, not God in the flesh even though Isaiah had predicted, “Therefore the Lord himself shall give you a sign; Behold, a virgin shall conceive, and bear a son, and shall call his name Immanuel” (Isaiah 7:14). “And he shall pass through Judah; he shall overflow and go over, he shall reach even to the neck; and the stretching out of his wings shall fill the breadth of thy land, O Immanuel” (Isaiah 8:8). Only the Bible – both Old and New Testaments – brings the Creator down to the lowest level of humankind in order to elevate humanity to a place near equal to God Himself. (The created thing can NEVER be equal to its creator.) The thought is incomprehensible. The method seems too extreme. If God is so great – omniscient, omnipotent, omnipresent, etc. – could He not come up with a more sensible plan? Surely, some kind of merit system to earn a place at His side would be more appropriate. At least, that is what every other world religion offers. Man must do certain things – pray five times a day while facing Mecca, crawl ten miles over sharp rocks to light a candle for a saint, disassociate oneself from all worldly things, etc. – to appease the gods. However, that is not what the God of the Bible does (or did). He took extreme measures to rescue His fallen creation. Man severed the intimate bond he had with his Creator at the Garden of Eden (Genesis 3:6-7). Love is an act of the will. It is always an act of the will. It cannot be imposed. It cannot be coerced. It must be offered and accepted freely and willingly, otherwise it is not love. Therefore, God placed only one stipulation on the man He created. “And the LORD God commanded the man, saying, Of every tree of the garden thou mayest freely eat: But of the tree of the knowledge of good and evil, thou shalt not eat of it: for in the day that thou eatest thereof thou shalt surely die (Genesis 2:16-17, emphasis mine). The man chose wrongly, and all of mankind, along with the whole of creation, suffered the curse of that choice. God introduced temporary measures to cover for human shortcomings – He shed the blood of innocent animals to cover (atone) their nakedness (Genesis 3:21), He accepted the sacrifice of innocent animals for the sins of man (Genesis 4:4; 8:20-21), and He institutionalized the sacrificial system shedding innocent animal blood to atone for sins (Exodus 12) – but this was insufficient. “For it is not possible that the blood of bulls and of goats should take away sins” (Hebrews 10:4). Animals, while innocent of any wrongdoing, are not responsible for the fall of man. The sentence for the infraction was death for the guilty party – the man. Therefore, the only reasonable and adequate sacrifice must be that of an innocent man, but there are none. “For all have sinned, and come short of the glory of God” (Romans 3:23). What then! God took extreme measures to resolve the problem. God, Himself, put on human flesh. Through an act possible only for the omniscient, omnipotent, Creator God created a single-cell human zygote, in the pure virgin womb of a young Jewish maiden that developed as a normal human embryo. “But when the fulness of the time was come, God sent forth his Son, made of a woman, made under the law” (Galatians 4:4). God was born like any normal human baby. “Behold the Lamb of God, which taketh away the sin of the world” (John 1:29). “Christ Jesus: Who, being in the form of God, thought it not robbery to be equal with God: But made himself of no reputation, and took upon him the form of a servant, and was made in the likeness of men: And being found in fashion as a man, he humbled himself, and became obedient unto death, even the death of the cross” (Philippians 2:5-8, emphasis mine). Only the blood of a perfectly sinless, innocent man could suffice to pay the “wages of sin” (Romans 6:23). God took extreme measures to buy back His fallen creation. There was no other way to solve the sin problem. Jesus said, “I am the way, the truth, and the life: no man cometh unto the Father, but by me” (John 14:6, emphasis mine). 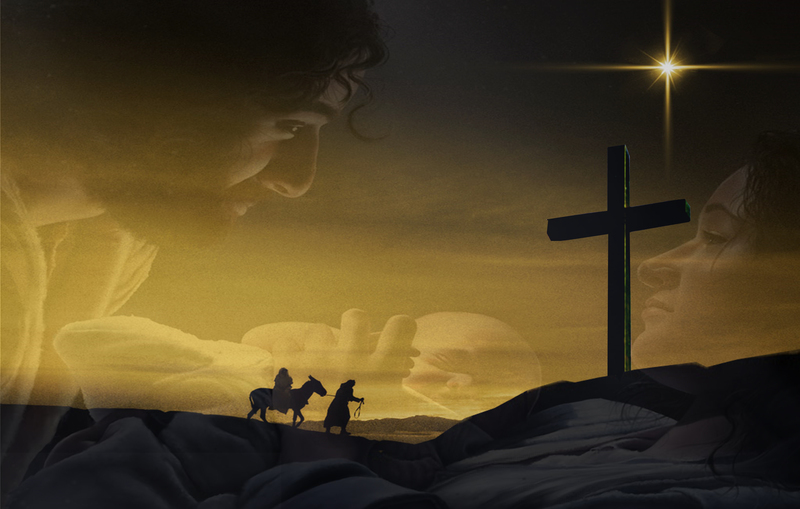 The next time you view a nativity scene, look beyond the sweet baby in the manger and see the cross. Two trees still grow in God’s garden, the Tree of Life, i.e. the Cross of Christ, and the worldly tree of man’s perverted “knowledge of good and evil.” One tree gives eternal life, the other eternal death, i.e. eternal separation from the Creator. The choice is yours. Source: WHERE IS THE LAMB? Comments Off on WHERE IS THE LAMB? The events surrounding this seventh sign were previously covered in the discussion of Jesus’ fifth I AM statement: “Jesus said unto her, I am the resurrection, and the life: he that believeth in me, though he were dead, yet shall he live: And whosoever liveth and believeth in me shall never die. Believest thou this?” (John 11:25-26, emphasis mine). Jesus “stedfastly set his face to go to Jerusalem” (Luke 9:51) as He made a stopover in Jericho along the way. The cross loomed ominous – less than two weeks away – when He received word from Bethany, “Lord, behold, he whom thou lovest is sick” (John 11:3). It was Lazarus. The content of the message did not convey the gravity of the matter. “When Jesus heard that, he said, This sickness is not unto death, but for the glory of God, that the Son of God might be glorified thereby” (John 11:4, emphasis mine). However, it was “unto death,” and the Lord knew it. “When he had heard therefore that he was sick, he abode two days still in the same place where he was” (John 11:6, emphasis). After the two-day delay, Jesus “saith he to his disciples, Let us go into Judaea again … Our friend Lazarus sleepeth; but I go, that I may awake him out of sleep.” (John 11:7, 11). Sleep, for someone who is sick, helps the healing process. The disciples understood this. They also understood that Jesus’ life was in peril in Jerusalem. “His disciples say unto him, Master, the Jews of late sought to stone thee; and goest thou thither again? … Then said his disciples, Lord, if he sleep, he shall do well” (John 11:8, 12, emphasis mine). Jesus completely knew and understood the situation although the euphemism escaped the disciples’ conscious thought, so to clarify, “Then said Jesus unto them plainly, Lazarus is dead” (John 11:14, emphasis mine). The small village of Bethany was about a day’s walk from Jericho. Lazarus probably died shortly after the messengers departed to Jericho. The travel took a day. Jesus delayed two days before leaving for Bethany and He took another day to arrive – four days total. In the minds of Martha and Mary, Lazarus was too far gone for a resurrection now. They were resigned to wait until the resurrection at the end of time. Jesus asked to see the grave (John 11:34), and to their shock, Jesus asked for the stone to be rolled away from the opening. “Martha, the sister of him that was dead, saith unto him, Lord, by this time he stinketh: for he hath been dead four days” (John 11:39, emphasis mine). What was He doing? Did Jesus want a private viewing? By now, the process of decomposition would have caused the body to reek. Surely, Jesus could not bring life to a decaying body! “Jesus saith unto [Martha], Said I not unto thee, that, if thou wouldest believe, thou shouldest see the glory of God? … And when he thus had spoken, he cried with a loud voice, Lazarus, come forth” (John 11:40, 43). The dead man responded, and though bound in grave clothes, walked out of the cave. Jesus demonstrated His power over death. He said, “I AM the resurrection and the life” (John 11:25, emphasis mine), and He proved it by giving life to one for whom consensus offered no hope. FOUR DAYS dead and Jesus brought Lazarus back to the land of the living. From the beginning, Jesus knew what He would do. “When Jesus heard that, he said, This sickness is not unto death, but for the glory of God, that the Son of God might be glorified thereby” (John 11:4, emphasis mine). Then before the skeptical crowd that included that included some of His harshest opponents (John 11:45-53) Jesus prayed, “Father, I thank thee that thou hast heard me. And I knew that thou hearest me always: but because of the people which stand by I said it, that they may believe that thou hast sent me” (John 11:41-42, emphasis mine). Luke relays an account given by Jesus of a rich man that died and went to hell and a beggar by the name of Lazarus (different person) who also died and was carried by the angels to Abraham’s bosom (Luke 16:19-31). The rich man in hell could see Lazarus enjoying paradise with Abraham. After failing get relief for himself, he requested that Lazarus be sent back to the world of the living and evangelize his brothers, for he thought, “if one went unto them from the dead, they will repent” (Luke 16:30). The brothers had the Law and the Prophets, i.e., the Bible. In other words, they had all they needed to avoid the same fate. Abraham’s response settled the matter. “And he said unto him, If they hear not Moses and the prophets, neither will they be persuaded, though one rose from the dead” (Luke 16:31, emphasis mine). The truth of this assertion could not be better illustrated than in the reaction of the religious leaders that witnessed “one that rose from the dead.” Rather than believe in Jesus, who raised the dead, they sought to kill Him. “Then from that day forth they took counsel together for to put him to death” (John 11:53). Not only that, but now Lazarus was a liability. “But the chief priests consulted that they might put Lazarus also to death; Because that by reason of him many of the Jews went away, and believed on Jesus” (John 12:10-11, emphasis mine). Truth is offensive. “Jesus saith unto him, I am the way, the truth, and the life: no man cometh unto the Father, but by me” (John 14:6, emphasis mine). Many would rather destroy the Truth than submit to Him, but the Truth will not die. “And the Jews’ passover was nigh at hand: and many went out of the country up to Jerusalem before the passover, to purify themselves” (John 11:55). In a few days, Jesus would be put to death, but after three days, He would do an even greater miracle than raising Lazarus. Jesus Himself would conquer death and rise from the grave. Yet, many are not “persuaded, though one rose from the dead.” – Jesus Himself. Do you believe? You have the Bible. You have the voices of thousands of “prophets” declaring the Word of the Lord. Jesus is not in the grave. What more do you need? This life you have been given is the only opportunity you will ever have to make that choice. Tomorrow is not guaranteed. “While it is said, To day if ye will hear his voice, harden not your hearts” (Hebrews 3:15). After this life, there are no more chances. Jesus rose from the dead and lives forever to give us eternal life. “Believe on the Lord Jesus Christ, and thou shalt be saved” (Acts 16:31), and you will not end up like the rich man being tortured in the flames (Luke 16:24) with no escape. See Matthew 9:18-26; Mark 5:21-43; Luke 8:40-56; Luke 7:11-16. Eli Lizorkin-Eyzenberg, The Jewish Gospel of John: Discovering Jesus, King of All Israel, (Jewish Studies for Christians, Tel Aviv, Israel, 2015), 184.